Looking to purchase a Laurel hedge? Then this guide can help you out. There are many types of laurels, and variants of their forms, and it may prove to be difficult for people who have just started gardening or are considering planting hedges for the very first time. In this post, we will discuss the types of laurel that are grown extensively in the United Kingdom and throughout Europe. The Common Laurel, or English laurel, or cherry laurel, makes a great portion of all hedging plants sold in the United Kingdom. If the right conditions are met, this hedging plant can grow up to 60 cm every year. This quick growth allows it to be available in many different sizes. This is ideal for people who wish to install the hedge and get a dense foliage barrier speedily. Who should choose Common Laurel? People who live in areas with extreme winters. The laurel hedge can thrive in temperatures as low as -20°C. The Portuguese Laurel has dark green leaves and is a bushy, evergreen hedging plant. Its leaves are much smaller than that of the cherry laurel. 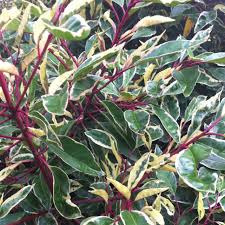 It is often preferred by people looking for Laurel hedge for its distinctive red stalked ovate and stems. It can grow up to 45 cm in a year under ideal conditions. Who should choose Portuguese Laurel? Individuals who wish for the hedge barrier to last all year round. This is an evergreen plant and provides exactly that. Let's talk about cultivation! The Common Laurel can grow in almost all types of soils except waterlogged and shallow chalky ones. It can grow in both shade and full sun as long as it is watered properly during the establishment of the roots. You can find the common laurel in potted, bareroot, rootballed, pallets of potted and pallets of rootballed forms at Derwen Wholesale. The Portuguese Laurel will grow in all free draining soils including chalk soils. If you want the Portuguese laurel hedge, you can find it in containerised, rootballed and pallets of rootballed forms at our website. The Prunus lusitanica ‘Variegata’ is a form of the Portuguese laurel. It has a narrow white edge on all of its oval shaped leaves and is easy to control. It is available at our website in potted form. Our experts are ready to aid you if you need to learn more about these laurel hedges. Message us or call us at (01938) 553015 to discuss your queries and needs. Shop our laurel hedges today! Browse our inventory and take your pick.